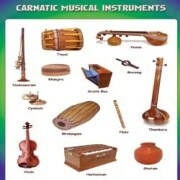 KalidasaMusical instruments dating to the prehistoric period is discovered from archaeological excavationsin India. This is especially from the Indus valleysites where music had a prominent place in its society. Several musical instruments like drums and statuettes representing dancing poses were found from the Indus Valley sites. Statuette of Rudra who is worshipped as the deity of dance, music and drama was found from a Harappan site. Besides, various types of stringed instruments are also discovered from the Indus sites. The discovery of Ravanahatha, the seven-holed flute from a Harappa site suggests that musical instruments and music played an important role in Indus valley civilization. The arrival of the Aryans marked the beginning of Vedic literature. This was when priest chants, and poetries came into being. The Vedic literature describes musical instruments and singings which were performed during sacrifices and as part of rituals for evoking the god. Music was seen as an excellent means for the realization of god. In the Vedic period, music originated from chanting of Vedas. The contents of the Rigveda were mainly poems chanted by priests and passed onto generations. The memorization of the sacred text by the priests included up to eleven musical forms of recitation of sacred verse. Gandharva Veda The priests chanted hymns in a musical tone with the pronunciation according to the tune. Priests used to perform group chanting at the sacrifices. The vocalising of syllables (Sthobhaksaras) in melodious and rhythmic tone created the sound of music. There are several references to vocal music in Vedas, Upanishads, SrimadBhagavata, the Puranas and the epics. Gandharva Veda dealt especially with the science of music but its theories are lost in the vagaries of time and space. Samavedais another source of music that was meant to be sung. It contains large number of tunes or Samans to address different elements of nature like; the cloud, seasons, tree, plant and the animals etc.The Samaveda, consists of a collection (samhita) of hymns intended to be sung using melodies called Samagana whose musical forms are indicated in the portions of the hymns. These hymns were sung by Udgatar priests at sacrifices, in which the juice of the Soma plant,was mixed with milk and other ingredients, to be offered to various deities. 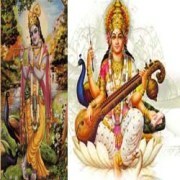 Hindu religion gives great importance to music. In Hindu mythology, each deity is associated with some kind of musical instrument. Goddess Sarasvati is seen with Veena in her hands. Lord Shiva is associated with Damru and Lord Vishnu with conch; Lord Krishna is with flute and Narada with an Ektara. Music was considered as a source of ancient Indian culture. It was an integral aspect of Sanskrit dramas like AbhijnanaShakuntalam, Mirchakatika. 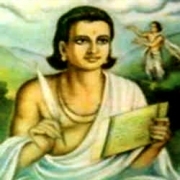 The fourth act of Vikramoryasiya by Kalidasa used different musical compositions like aksiptika, dvipadika, jambhalika, khandadhara, carcarj, khandaka, etc. 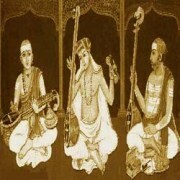 There were many works on music written in later periods explaining various characteristics, types and techniques of music.The traces of music in ancient India can be produced from written works like NātyaShastra. NatyaShastra is an ancient Indian treatise on the performing arts, theatre, classical dance and classical music. It was written during 200 BC and 200 ADand contains 6000 shlokas. It is attributed to a sage Bharata Muni. Musical instrumentsThe NatyaShastra is based upon a much older text called the Nātya Veda, which contained 36,000 shlokasthat do not survive now. It was during 500BC - 200BCRamayana was written by Valmikithat has shlokas composed in rhythmic tone. Mahabharata mentions gandharva or music in the form of musical instruments, dance and singing. It’s during this time Pathyasangeet, a special musical mode in Indian musicology was introduced. Music was mentioned in the Jain literary sources. Music also evolved during the Buddhist era where monks sang. The Gupta period considered the Golden Age of arts, culture and education in ancient India saw effloresce of the ancient Indian music. Gupta king Harshavardhan was also a singer. It was during this time Samaj, ghata-nibandhan and other forms of music came into being. The book Kamasutra written during this time has reference to various arts forms like singing, dancing playing musical instruments and living. Kalidasawrote plays like 'Raghuvamsha' and 'Shakuntala' during this period. Indian music has developed through very complex interactions between different peoples of different races and cultures over a period of several thousand years. The references to music in ancient texts, aesthetic formulations, and depictions and written discussions of musical instruments offer clues about the ancient Indian musical traditions. The ancientIndian musical style has been preserved through oral traditionin an unbroken way till now. For example, musical notes or the structure of a raga, as we know them today, have had their origins in the Samavedic times. The surviving treatises explain musical scales and styles and provide clue to recapturing the musical journey of the ancient times. Tracing the musical journey of the past makes the picture of the present musical system crystal clear.